Tomorrow is the big day at Gallery Nucleus. Hope to see you there! And now, some more progressions. 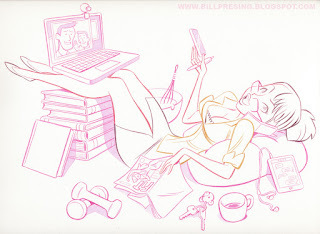 This weekend is my Horoscope Honeys gallery show and calendar release at Gallery Nucleus. If you're in the LA area please drop in, see the original art and get a calendar. Or heck, buy the original art. It's for sale too! A few more progressions for your enjoyment. My Friend Matt Jones is putting together a Ronald Searle retrospective exhibition at the Cartoon Art Museum in San Francisco. To do so he needs to raise some funds, so he's holding a small Ebay fundraiser featuring Searle homages by his friends in the animation industry. 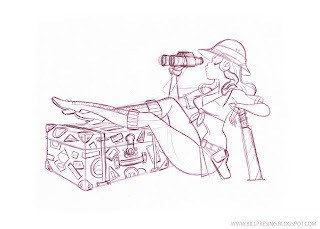 I sketched a St. Trinian's inspired girl to help out. Keep an eye on his blog for auction details. Today I'll demonstrate my painting process for the calendar a bit. In an attempt to save time I actually painted all the pieces simultaneously, production line style. So for instance, I would mix my first color then apply that color to all of the pieces that would contain it, then I'd mix the second color then apply it to all the pieces that would contain that one. And so on. I think it really did save me time, and it gave the calendar a nice uniformity to all the pieces. I usually make an enlargement of my pencil drawing to transfer onto the watercolor paper via light box. I then like to take that copy and draw on top of it a lighting study which will be my guide when I paint the shading. After all the art is transferred I paint all the line art. As you can see, I completed all of the line art across all of the pieces (reusing as many of the colors as possible) before moving on to the next stage. Next is the underpainting. I use acrylic wash to slowly build up all the shading and values. Again, I do this for all the pieces. Lastly I apply Luma concentrated watercolor. It's completely transparent so it retains all of the acrylic shading perfectly. Of course this whole process took me weeks because there are twelve pieces (plus a bonus) but I finished them all at the same time! Calendars are now available for pre order on the Gallery Nucleus website! Click here. 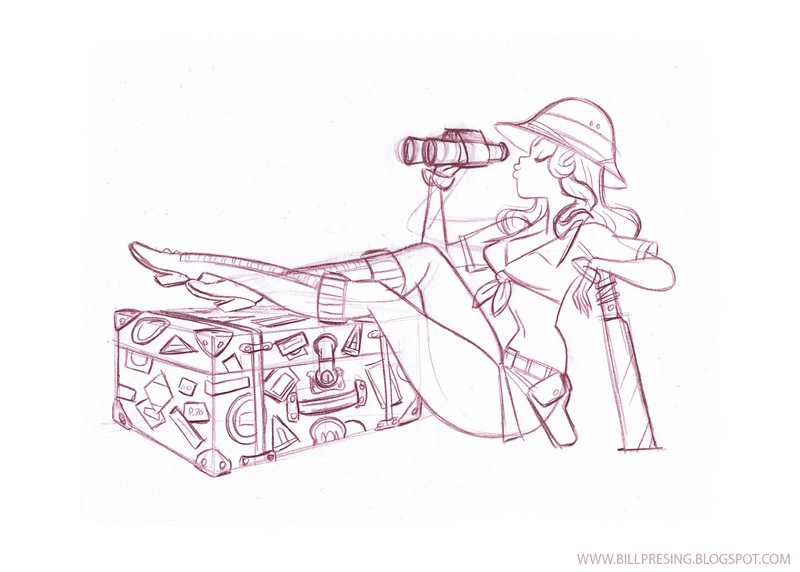 And now the next set of roughs for my horoscope themed pin up calendar published by Gallery Nucleus.